Haristobald Photography: Kinga on the rocks. Going to hollidays is always full of dilemmas for a photographer. What camera, wich lenses to take with, speedlights or not, how much, wich gobo's, tripods,... I always take more time to fill my photobag that to choose and put clothes in my travelbag. This time I took my G10 (again) and two speedlights with the minimum gear coming with the flashs. Umbrella holders, gels, shoot-thru-reflective foldable umbrella, lumiquest soft box III, tripod, monopod and honl snoot. A bunch of gear tough. An thid time I did used all of this gear at least once during the journey. I will post a few different posts about this trip because the pictures I took where realy too different to use them all in one single post. And some realy deserve their stories to be told. More to come, stay tuned. This top of the post picture of Kinga was taken almost at noon on a full blue sunny day. The kind of moment you tell yourself "take the picture for the souvenir but it will stay deep in the hard drive like forever..."
To take an "worth to share" picture I had to make it special. One solution is to make the light better. Actually, in those situation you have to improve the lighing! The use of speedlights is an easy and fast way to light your subject in most of difficult ligthing situations. I used a lumopro LP 160 on a hand hold monopod. If a tripod is easier to use for a shoot on location, a monopod is lighter and take far less space in the bag then the first one. At the end of the day you realy feel the difference in your back! Told you: travel photography is full of dilemmas! On the flash I putted a 1/4 CTO gel to avoid having a ghostwhite lighting on my subject, who would like sick without a warming gel. 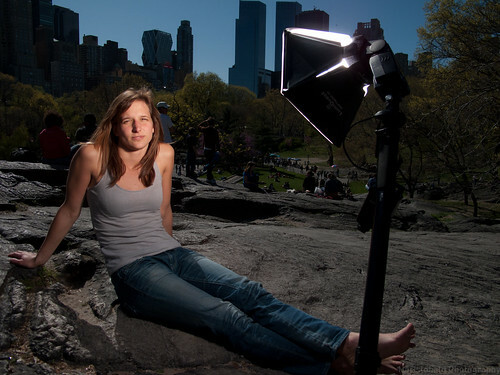 Then I placed a small lumiquest III softbox. It's small but when placed very close to my model it can smoothen my light enough to give a softer look. To trigger the flash I used pocketwizzards plus II. Lightweight powerfull and very versatile. The last secret is the use of my travel friendly canon G10. This camera alows me to sync my speedlights up to 1/500 sec, very usefull to darken ambiant light. The picture below shows how underexposed was the ambiant. Getting in shape in DC!